Two years ago, the British Trust for Ornithology (BTO), organised a survey of ptarmigan numbers on Scotland's mountains. The results were reported in autumn 2007. The idea was for volunteers to walk along a route above 750m, as chosen by the volunteer, recording numbers of Ptarmigan, and other hill birds, seen along with signs of their presence such as droppings or feathers. The BTO has a long track record of using volunteer amateurs to collect data that can then be used scientifically. Indeed, this very approach of using volunteer amateurs was a major inspiration behind NEMT's own hilltracks' survey. Apart from getting surveys done comparatively cheaply, it involves some of the people, who 'use' the mountains, in the actual condition of the land and hence contributes to a more informed public. This survey was set up to determine if this approach could be used to monitor how species such as Ptarmigan are being affected by climate change and other factors such as changes in grazing pressure by sheep and deer, changes in atmospheric pollutants and disturbance by humans. Surprisingly little field information exists to challenge or confirm predictions. 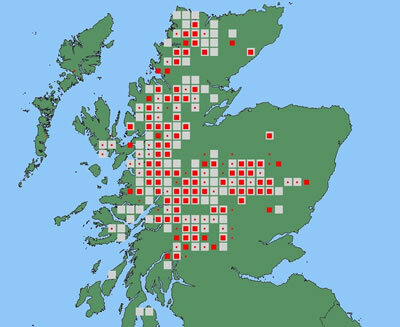 The aim was not to work out the total number of Ptarmigan in Scotland but to explore the potential for monitoring upland birds in these remote habitats. Over 100 people took part, covering a distance of 3,212 kilometers. Sixteen people each surveyed over 50 kilometers! 1,027 Ptarmigan were recorded during the various walks. The BTO analysed the findings, for example, using data on sightings of red grouse to work out the proportion of droppings that could be allocated to Ptarmigan. They worked out an 'encounter rate' of Ptarmigan seen per kilometre. Obviously many birds would have been missed and some individuals will have been counted a number of times. The important thing is that changes in encounter rate are likely to be in proportion to changes in the overall population. The BTO looked at how encounter rates changed with the month and with snow cover. They findings were compared with those from professional ornithologists. The good news is that the numbers recorded by amateurs were very comparable with those from professionals. Interestingly, but not surprisingly, the BTO found that both volunteers (for ease/safety) and Ptarmigan (to find food) may be avoiding areas covered with snow in the spring resulting in higher encounter rates. This sort of information can be used to improve the design of future surveys. Feather samples from 222 sites were collected and sent in the BTO. It is hoped that these can be used to study the population genetics in the hope of discovering whether our Scottish population should be viewed as a single one or whether it is divided in some way. A measure of how fragmented the Scottish population is would be a useful indicator of their adaptability to future changes (presumably, reductions) in their habitats. I took part and enjoyed it enormously and found it an easy thing to do while out hillwalking. Paying more attention to birds and signs of their presence enhances the walk and makes one more aware of the surroundings. I would recommend taking part in this sort of survey to anybody. Roll on the next update survey!